For other people named Billy Higgins, see Billy Higgins (disambiguation). 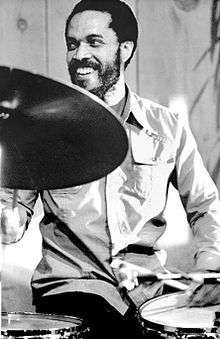 Billy Higgins (October 11, 1936 – May 3, 2001) was an American jazz drummer. He played mainly free jazz and hard bop. Higgins was born in Los Angeles. Higgins played on Ornette Coleman's first records, beginning in 1958. He then freelanced extensively with hard bop and other post-bop players, including Donald Byrd, Dexter Gordon, Grant Green, Joe Henderson, Paul Horn, Milt Jackson, Jackie McLean, Pat Metheny, Hank Mobley, Thelonious Monk, Lee Morgan, David Murray, Art Pepper, Sonny Rollins, Mal Waldron, and Cedar Walton. He was one of the house drummers for Blue Note Records and played on dozens of Blue Note albums of the 1960s. In 1989, Higgins cofounded a cultural center, The World Stage, in Los Angeles to encourage and promote younger jazz musicians. The center provides workshops in performance and writing, as well as concerts and recordings. Higgins also taught in the jazz studies program at the University of California, Los Angeles. He was divorced from wife Mauricina Altier Higgins and had three sons, William, Joseph, and David, as well as a stepson Jody. His youngest son Benjamin resides in Los Angeles. He also had two daughters, Rickie Wade and Heidi. He died of kidney and liver failure on May 3, 2001 at a hospital in Inglewood, California. ↑ James Nadal (ed.). "Billy Higgins". All About Jazz. Retrieved 2010-11-16. 1 2 Ratliff, Ben (2001-05-04). "Billy Higgins, 64, Jazz Drummer With Melodic and Subtle Swing". New York Times. Retrieved 2010-11-16.